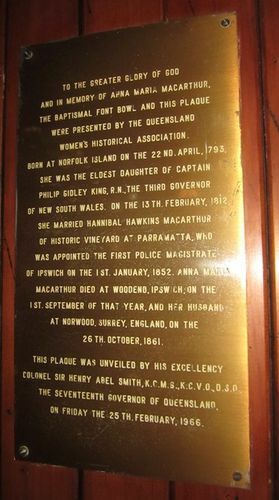 A plaque and baptismal font bowl commemorate Anna Maria Macarthur, who was the wife of the first Police Magistrate of Ipswich. And In Memory Of Anna Maria Macarthur. Colonel Sir Henry Abel Smith, K.C.M.G., K.C.V.O., D.S.O. On Friday The 25th, February, 1966.